This morning’s NDDC Block Head Gathering focused on technology topics. 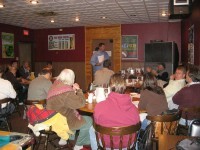 The subjects had been requested by the attendees at the previous meeting. Jordan Bechdol, a St. Olaf College student and College Board of Business Consultants volunteer, presented his recommendation for a business networking tool. The tool was an idea that came out of the NDDC-Chamber-EDA Retail Support Strategies work last year. With retailers confined to their stores on the same schedule, face-to-face interactions are difficult. Communications about a snow removal contractor, City awning regulations, or a promotional opportunity will soon be possible at any time. Craig Dunton, director of the St. Olaf College phone company, talked about the services that they could offer downtown businesses. With the Carleton College and St. Olaf College fiber backbone, the speeds exceed anything else available in the area. The “pipe” is installed along Washington and Water Streets and is easily accessed. A number of downtown business are already connected and praise its speed, service and price. Melissa Reeder, City of Northfield IT Director, gave a brief update on the City’s current Fiber Optic Feasibility Study. The City’s goal it to pursue potential partnerships with existing providers to achieve a wider distribution of capabilities throughout the city. There will be an Open House on the topic next Thursday, November 6th, 7:00 p.m. at City Hall. As a follow up on other topics raised at the previous Block Head Gathering, the NDDC is featuring two special guests at next Tuesday’s (November 4th) Downtown Forum. Scott Taylor and Chad Oudekerk, professors at South Central College, will share their ideas for increasing sales through smart management and technology use.